It is important to review the anatomy of the chest wall and thoracic cavity, as you will use anatomic landmarks to document the location of respiratory assessment findings. The thoracic cavity is made up of 12 pairs of ribs that connect in the posterior thorax to the vertebral bodies of the spinal column. In the anterior thorax, the first 7 pairs of ribs are attached to the sternum or breastbone by cartilage. The lower 5 ribs do not attach to the sternum. The 8th, 9th, and 10th ribs are attached to each other by costal cartilage. The 11th and 12th ribs, known as floating ribs, are not attached in any way to the sternum; they move up and down in the anterior chest, allowing for full chest expansion. Please review the important landmarks of the bony thoracic anatomy. 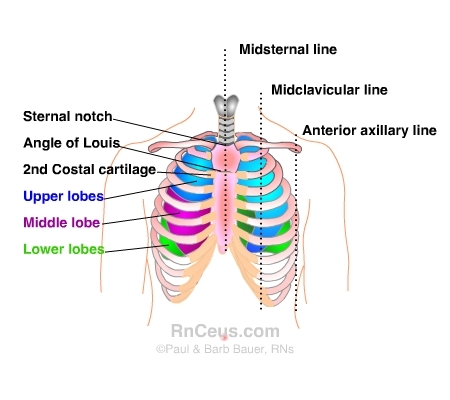 The angle of Louis (also called the sternal angle) is a useful place to start counting ribs, which helps localize a respiratory finding horizontally. If you find the sternal notch, walk your fingers down the manubrium a few centimeters until you feel a distinct bony ridge. This is the sternal angle. 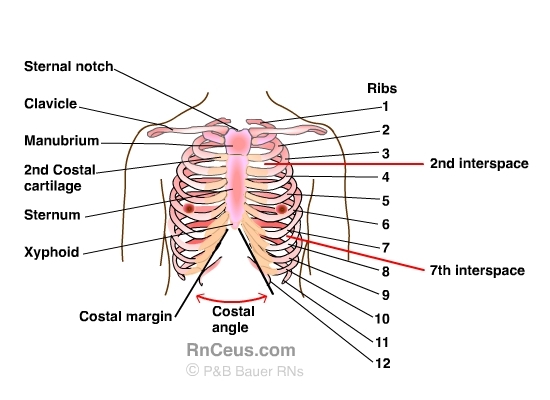 The 2nd rib is continuous with the sternal angle; slide your finger down to localize the 2nd intercostal space. The angle of Louis also marks the site of bifurcation of the trachea into the right and left main bronchi and corresponds with the upper border of the atria of the heart. Reference lines help pinpoint findings vertically. For example, the major division ("fissure") between lobes in the anterior chest crosses the 5th rib in midaxillary line and terminates at the 6th rib in the midclavicular line.